if i have a knack for these things. to counter the winter-like weather outside. on the stove top, bring a pot of water to boil. if you have a steamer, this step will be easier. 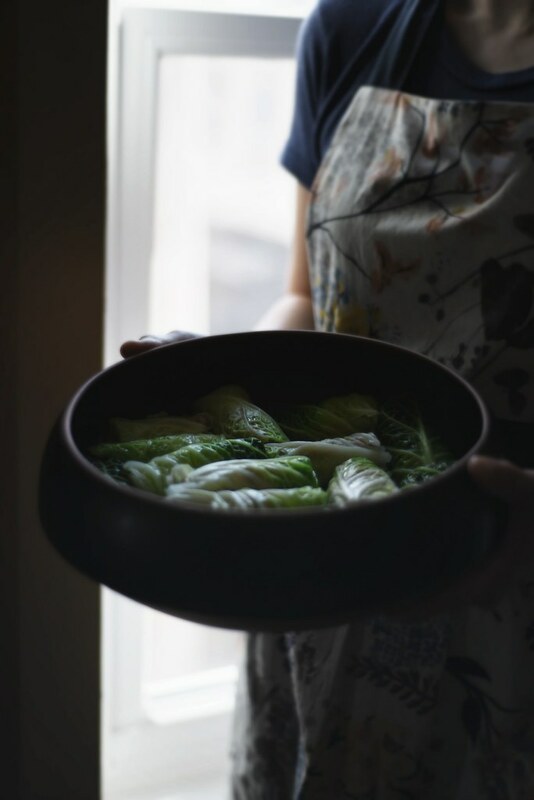 steam the cabbage leaves for anywhere from 5-10 minutes, until pliable. if you don’t have a steamer, blanch the leaves, a couple at a time done in batches. you’re looking for translucent leaves that are pliable. in a pan, heat up some olive oil. saute the onions and garlic. add in the ginger, cinnamon, nutmeg. season with salt & pepper, be generous. transfer half the mixture into a big mixing bowl. set aside. in the pan with the remaining onion mixture, add in the diced tomato, tomato paste, brown sugar, and sherry wine vinegar. season with salt & pepper. warm through, turn off heat and set aside. in a food processor throw in the rice and nut milk. pulse until a combined. add in the reserved onion mixture, ground pork and sausage, salt & pepper and PULSE to combine. you don’t want the mixture to turn to mush, but all the ingredients need to be thoroughly mixed together. using one leaf at time, with the hard ribs removed, roll about 2-3 TBL of the meat mixture. here’s a very amateur video of how to roll something. 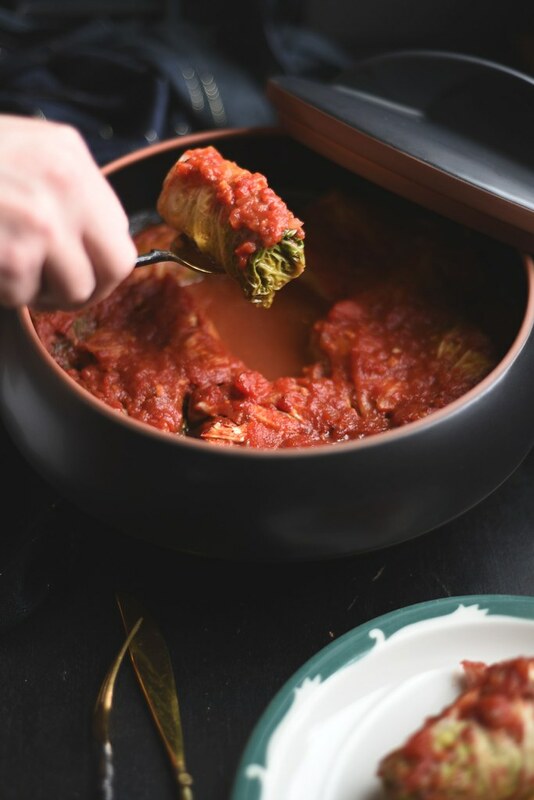 arrnage the rolls seam-side down in a heat proof casserole dish. pour tomato sauce over the rolls, cover with foil and bake for about 40-45 minutes. remove the foil and bake for another 15 minutes. 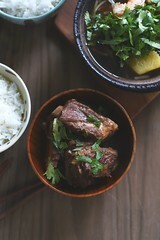 serve with side of braised radishes. Oh how I love stuffed cabbage. I make various versions of it, and love them all. I like your idea of blending the rice with milk, it probably yields a much fluffier filling than when one only uses rice and leaves it whole. Great inspiration! 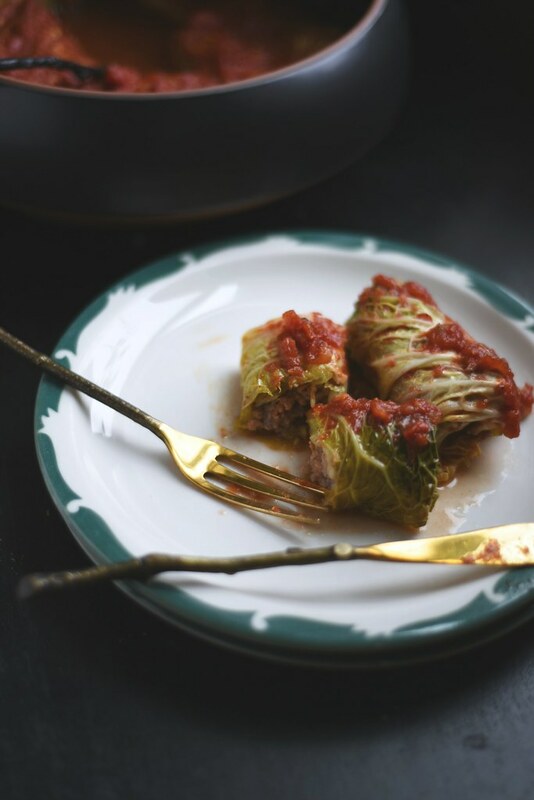 i think any version of stuffed cabbage is good, it’s one of the only times i can tolerate cabbage. I’ve bookmarked this recipe! Sounds so good that Im drooling already! thanks so much, hope you like it. 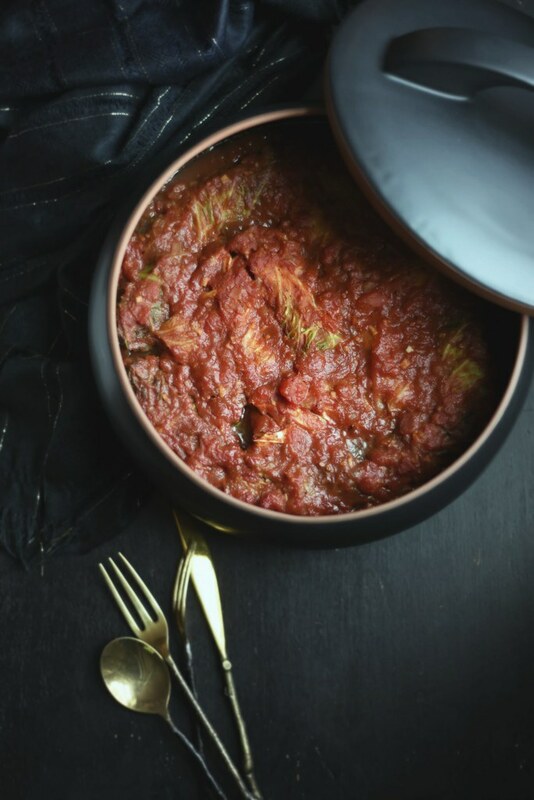 This dish is the very first thing I made on my blog. The photos were horrendous but the feeling of capturing grandma’s signature dish in my own home was enough to be blog worthy! I live the bowls and today first pic of you holding them! I also like the idea of adding oat milk here which is new to me. Hang in there waiting for spring. Im impatient too! 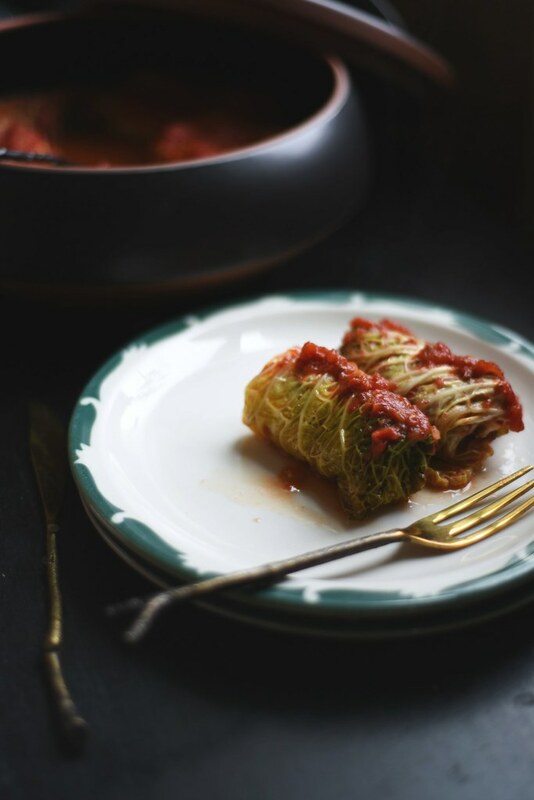 i think stuffed cabbage is such a comforting dish, my gma has a recipe for it too. hi amy, i hope you like it. and a ukrainian version, i’m intrigued! I go crazy repotting when I do it,.. and I don;t think I have a knack for those things, lol. Half of the plants thrive, the other half die. What a lovely dish, great idea. I was just going to comment asking how the greenery was faring, always breaks my heart a little when they got he way of all the world. Lovely casserole!